I am sitting here at my computer, heart beating wildly. Why? Because I was once again sure that I had a mouse under my bed. Little noises of undistinguished things rattling, etc. I freaked out! Turned around, and realized it was tissue paper in a shoe box being blown by my heater. 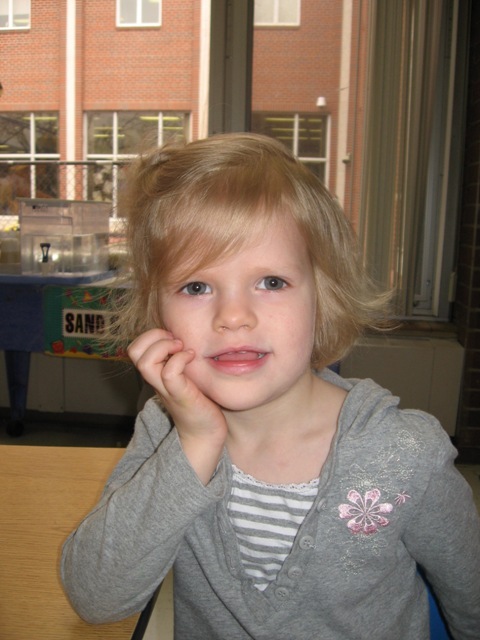 She looks TOO grown up! I’ve got a bunch of tidbits and no particular order, so here goes. 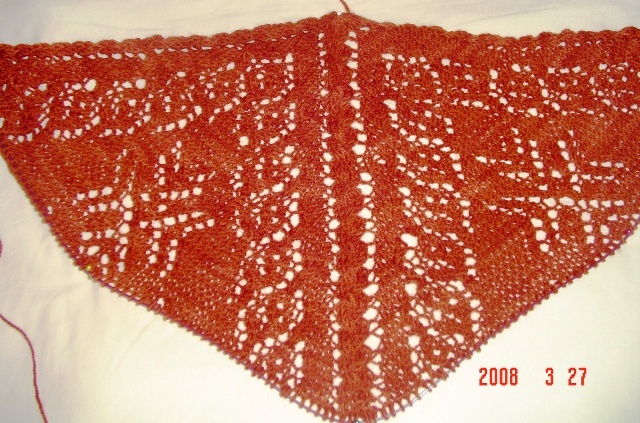 I’ve frogged SOTSii, because I have seen full shawls and I just don’t like the pattern. It isn’t something I will enjoy knitting, nor is it something I will wear. I can’t think of anyone to give it to, and I’d like to allot that nice alpaca to another project. So that is off my list. I’ve finished clue one of mystic light, and I am loving it. I am also coming to the conclusion of my grande clapotis. 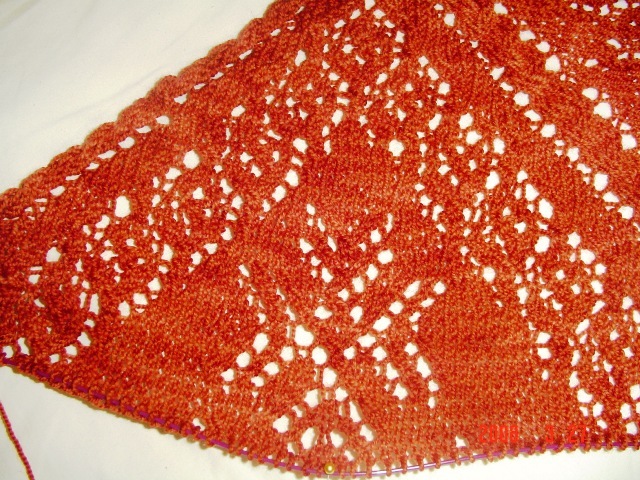 I am looking forward to a finished object post this week or this weekend. The orange koolaid overdyed with tea merino roving, hasn’t been worked on much this week. The spinning is coming out a bit more lumpy than I like because I badly felted the roving during its tea bath. 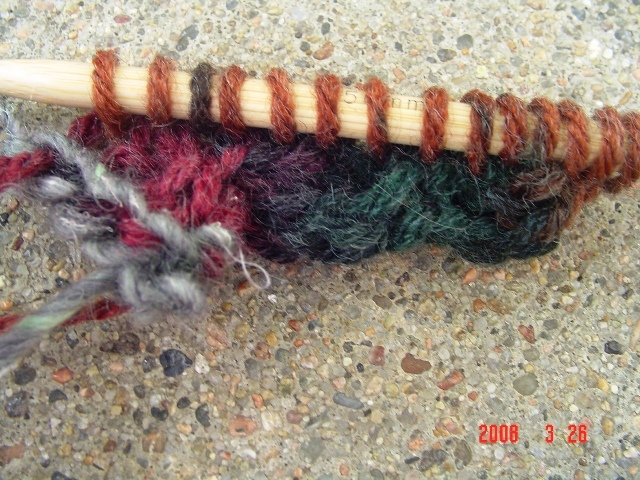 To counteract that, I have torn the roving into very thin predrafted strips, and I am no sort of predrafter at all. Luckily I have noticed that a well done navajo ply covers a multitude of evils, and that is what is in store for this roving. Speaking of navajo plying, have I mentioned how much I love it? 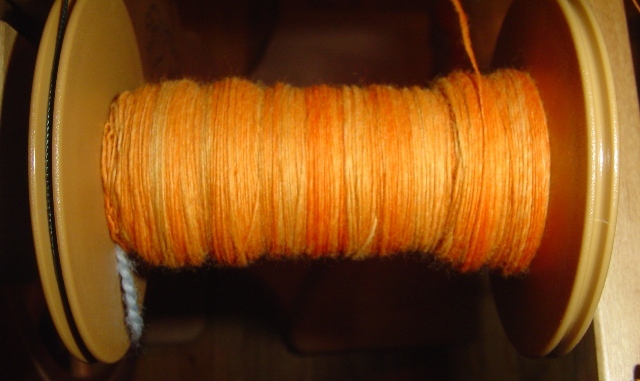 It feels like a very active type of plying, and plying has thus far been my least favorite spinning activity. I had heard that you might not even bother with navajo plying if you don’t have a tensioned lazy kate. I had no desire to spend cash on one, so I made my own. I took 2 binder clips and a length of crochet cotton and rigged the lazy kate that came with my wheel. 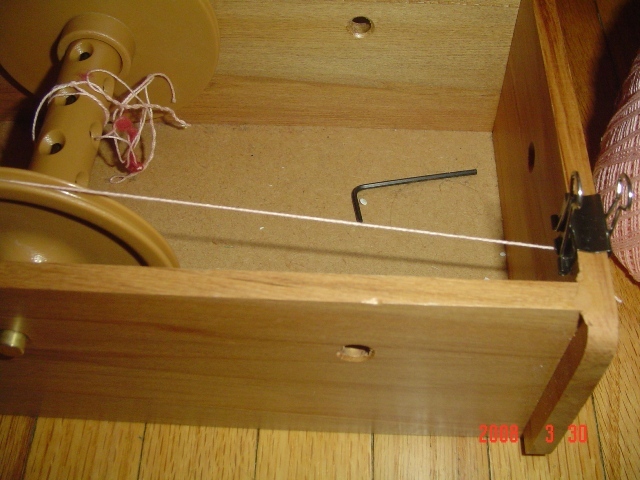 I just string it up over the bobbin, or bobbins, and make sure it is tightly clipped to the other side of the box. Works wonderfully! I am serious, no need for a fancy one here! 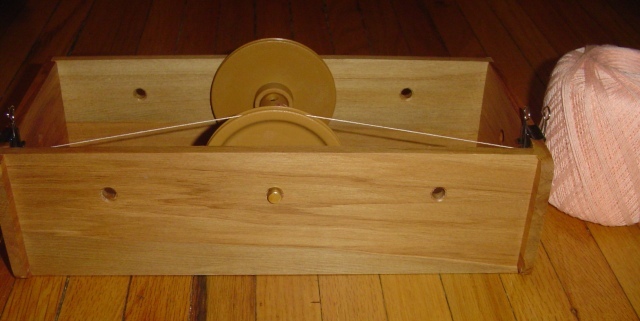 This has made plying easier, navajo plying is a breeze, and the bobbin has even stopped overspinning when I load the final product on the niddy noddy, which has been causing me major headaches. I love my tensioned lazy kate! Take pictures of my shoes! I haven’t seen J in about 6 weeks, and so when I visited this weekend, there were fun gifts waiting! That man just loves to shop and loves to gift people. He got me a pair of shoes which he thinks have great contrast and will look great with socks. I am, of course, thinking they will show off my hand knit socks wonderfully! I’ll take pictures tomorrow and you can tell me what you think. He had also picked up 2 cabled zip front cardigans deeply on sale, a blue one and a brown one. I was told to take them if I like them, or otherwise he will gift them to someone else. He thought I might like them because he knows I don’t like knitting cotton and am afraid of zippers. How right he is! $7 each, they were quite a steal, and they are mens sweaters so they have wonderful long arms, yet the cable rib pattern doesn’t look bulky on me. I also got….something else….but you will have to wait to see it!!! I just want to know how strange is it for a guy to love shopping so much, and know my sizes and what styles look great on me even better than I do myself?!?! Speaking of which, I played handy man this weekend. Yeah, who wears the pants in this relationship? So he has been telling me for the past year (almost) that he needs a book case. And boy does he ever! There are books everywhere, school books, fiction books, reference books, books in english, french, arabic, books of every shape and size, and nothing to hold them. Well I asked why he just didn’t get a bookcase, and it seems that he doesn’t much like putting furniture together because it takes him an inordinately long amount of time to get it right. So the idea was that he wanted to get something that was already assembled. Well that costs more, and then you need a delivery truck, but he doesn’t want to spend more. OK, so then you have to do the assembly. So I offered to do it. I’ve put together more complicated things than a bookcase, and if I put my mind to it and have a cup of coffee and concentrate, it usually goes well. So I wandered over there cordless screwdriver in hand, to put together a bookcase. Well apparently both my cordless screwdriver batteries are dead, cause I did charge them but it doesn’t work. Never fear, I had a back up plan. I began to put that bookcase together with him out of the room. Fairly soon though, he catches on to what I am doing and wants to come “help.” Now you have to understand that I work best in complete silence, and he talks…ALL…the…time. And suggest things. Which aren’t often right. His talking is his way of thinking it all through and figuring it out, but I have the directions and I am two steps ahead. I didn’t get irritated, or show how it wasn’t helping, I just continued to do things the way I knew they needed to be done. Soon after I hear “Maybe I should just keep my mouth shut, maybe I talk too much!” I look up and wink. He shuts up and gets his own screwdriver. I say, “I need 24 of those shorter screws over there.” and in that instant a new partnership was born. The rest of the bookcase was assembled, and assembled correctly the first time rather quickly. Until I sat on the couch and realized that the one thing I didn’t get was the little piece of molding under the top if the bookcase. It is turned the wrong way. He doesnt care and wants to leave it, and I have done nothing with it yet, but it is going to annoy me! I am sure the next time I am there I will have to fix it. Oh, and that bookcase hasn’t touched the tip of the iceberg that is those books. Looks fantastic (except for the molding) but there are still books everywhere. He thinks maybe he can get 2 more and assemble them himself, as he watched me do the first. Now, I think he can too, but I giggled because I want to see if 2 more moldings go on the same way I put the first on. So the next generation begins! Almost done with clue 1. Half of my tempted yarn roving knit up. 155 yards of sockweight yarn. The second skein is set up to be the same and match (as much as possible) the first skein, for some decent socks with all black heels and toes. I was discussing today with one of my Ravelry groups how I was having a terrible time starting Mystic Light. Every time I knit to the top of the set up pattern, I would end up with a mess of stitches that I couldn’t make heads or tails of. 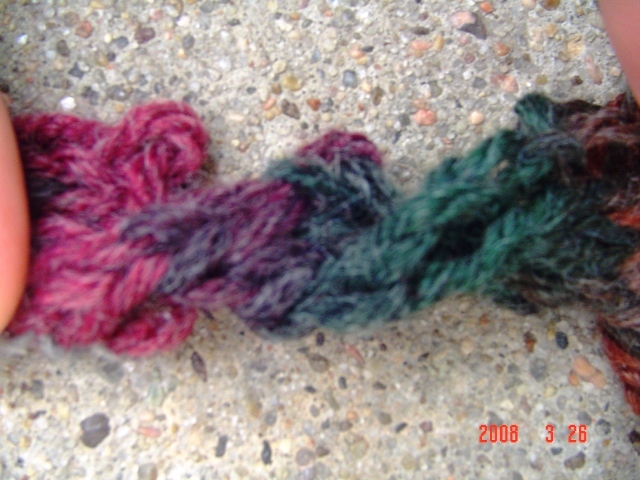 Finally after sitting with it for awhile, I realized that cables with no anchor stitches on the side twist. So I am going to attempt to explain what happened. 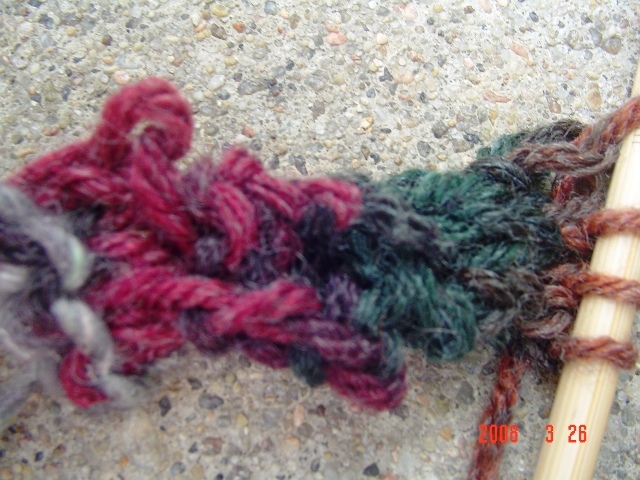 I used, for this, larger yarn, and the pictures came out a bit blurry but I think you will get the idea. Once I realized that I had to physically hold the cables in place, the pattern made more sense. Then picking up the stitches on the sides made a great deal more sense to me. And it also anchored the cables. And a quick picture of where I am on the project. 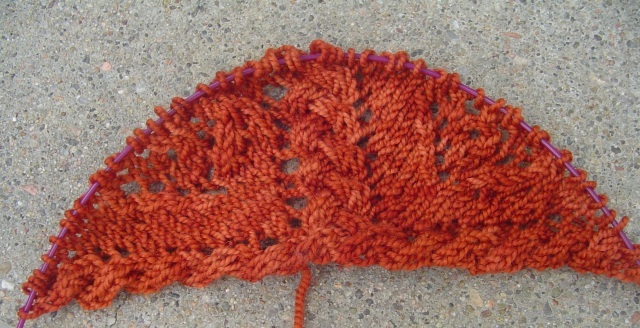 You can see how the initial cable pattern makes the cable line along the bottom which is continued as I work the pattern. It is very pretty!